We are pleased to inform you that we are in process of selecting 15 scrips from universe of small and mid cap stocks which can benefit investors in the year 2015. We are confident that these carefully selected stocks can outperform major indices like Sensex, Nifty, BSE Mid Cap and BSE Small Cap. We will share portfolio of 15 small & mid cap stocks for 2015 on 1st Jan'15 with all our paid subscribers. 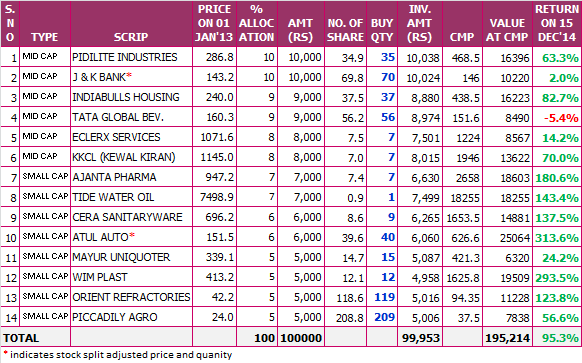 Its time to also review our Portfolio of 14 for 2014 released by our team on 1st Jan 2014, we are glad to share that our portfolio of 14 mid and small cap stocks have outperformed BSE Mid Cap and Small Cap Index by 45.9% and 29.9% respectively. Mid Cap index has given 49.4% (6,737 on 1st Jan'14 to 10,063 on 15th Dec'14) and Small Cap Index has given 65.4% (6,649 on 1st Jan'14 to 10,998 on 15th Dec'14) returns during the year where as Saral Gyan Portfolio of 14 mid and small cap stocks for 2014 have outperformed both indices giving absolute returns of 95.3% in same period. Star performer of our portfolio was Atul Auto giving returns of 314% followed by Wim Plast (294%), Ajanta Pharma (181%), Tide Water Oil (143%) and Cera Sanitaryware (137%) where as laggards were Tata Global Beverages (-5%) and J & K Bank (2%). We also take this opportunity to share the past performance of our recently released Diwali Muhurat Portfolio (released on 22nd Oct'14) which is outperforming Sensex and Nifty by 9%. Since 22nd Oct'14, Sensex has given returns of 2% (26,787 to 27,319), where as during the same period, Diwali Muhurat Portfolio has given absolute returns of 11%. As on date performance of Saral Gyan Diwali Muhurat Portfolio - 2014. Diwali Muhurat Portfolio was shared with all our members on 22 Oct'14 and we will review the performance of same before Diwali 2015. Hence, suggest our members to continue holding these stocks for time period of 1 year. If you missed the opportunity, you can choose to receive portfolio of 15 small & mid cap stocks for 2015 by subscribing to our services under Merry Christmas & Happy New Year 2015 offer, Click here to know more about the offer. Our selection process includes lot of research and data analysis. We first identify the sectors that are likely to do well in next 12 months. Having that done, we further refine our search to select companies from that sector. We create a portfolio worth Rs. 1 Lakh comprising 15 stocks so that it can help investors to create a model portfolio with lump sum investment upto 1 Lakh. We have given the different allocation to each of the scrips keeping in mind the risk versus returns ratio. We have also fine tuned the portfolio with mid-cap and small cap scrips from different sectors so that the investors can invest in a complete mix of stocks to balance their portfolio. Saral Gyan Portfolio of 15 for 2015 includes best of Hidden Gems and Value Picks recommended by our equity analyst’s team during last couple of years. Multi-bagger stocks are created because they are able to scale the opportunity rapidly. Titan Industries is a great example. In 2003-04, Titan‘s market cap was 500 crores. As on date, it is 32,700 crores. The fact that India is a booming marketplace of 120 crores consumers means that most products and services have a head start at trying to scale up their activities. Of course, we are no match for Warren Buffett and we do not have his conviction levels. So, we’ll stick to 15 stocks to begin with, which means that from 4% to 10% of the wealth will be invested in each stock. Saral Gyan Portfolio of 15 for 2015 will be emailed to all our Hidden Gems, Value Picks and Wealth-Builder members. Portfolio stocks holding period is minimum of one year, same will be evaluated by our analysts at end of 2015. 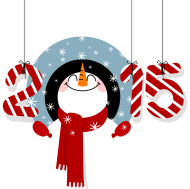 Enjoy discount up to 30% and attractive freebies under Merry Christmas and Happy New Year 2015 offer. To know more about the offer, click here. Hurry! Offer is for limited period and closes on 31st Dec'14.